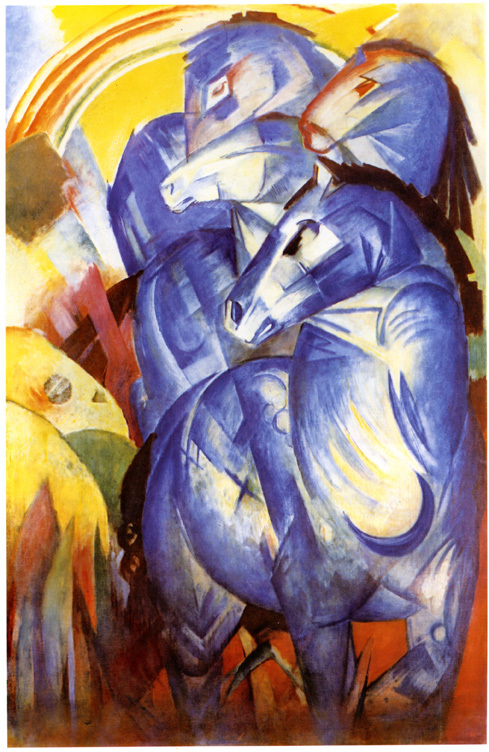 Franz Marc, Der Turm der blauen Pferde, oil on canvas, 200×130, 1913, location unknown. Turm der Blauen Pferde is two images, one the massive masterwork missing since 1945, the other a standard postcard in the Bayerische Staatsgemaldesammlungen in Munich. The images are fraternal, not identical twins, but they do show the same group of four horses. Franz Marc, Turm der blauen Pferde, watercolour on paper postcard, 14×9 cm, 1913, Private Collection on permanent loan to Nationalgalerie, Berlin. Marc made the anticipatory watercolor postcard – which he nonetheless considered a discrete and completed work – as a 1913 New Year’s greeting to Else Lasker-Schüler, inscribed with the title the full-size painting would inherit and keep when it went to Berlin for the 1913 Erster Deutscher Herbstsalon. The painting was begun in early January 1913 and finished inpeerless biography of Marc, Klaus Lankheit gives an account of the large painting that is both elegant and valuable, because Lankheit had the opportunity to closely study the painting that has been seen by very few people living today.2) Lankheit’s passage – which encapsulates a description of the celestial markings adorning the animals (one of the chief differences between the postcard and the painting) – makes clear that the magnificence of the horses is tied to their lifelike, equine characteristics – the horses advance toward us, tossing their manes, in apparent curiosity, and as real horses sometimes can be they are a little intimidating. Lankheit observes also how the “clear-cut crescent of the moon” is in contrast on the chest of the darkest of the four horses, acknowledging the individuation of the animals. 3) The horses in the painting inhabit a more vibrantly colored, have less distinct outlines, and fewer solar and lunar markings. Nevertheless, the open-topped, heraldic crescent has been retained on the chest of the front horse. The moon on the breast of the lead horse makes an allusion to a further relationship to antiquity. One museum collection replete with icons of the ancient world that seemed to intrigue Marc was excavated from the Hellenistic kingdom of Commagene in southeastern Turkey. 4) The lion relief shows some of the same astronomical decorations as the horses (and the stars surrounding them). Thus Marc connects the archaic with the modern thematically and visually. 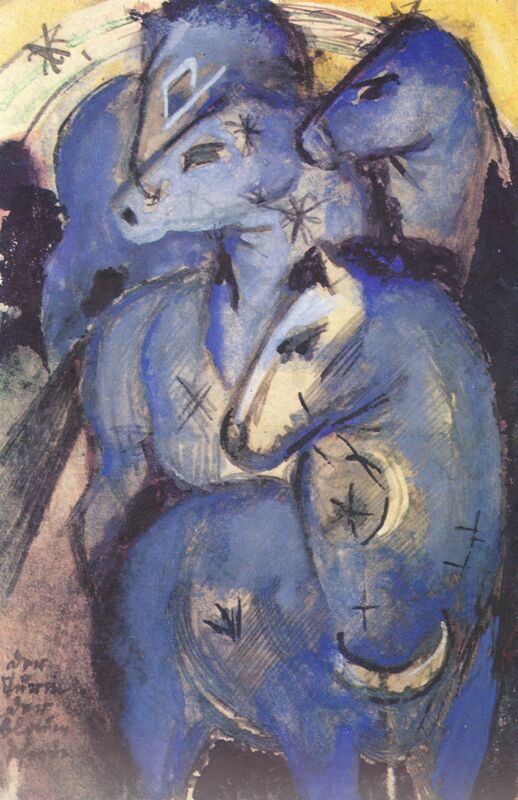 1)Franz Marc and Else Lasker-Schüler, Der Blaue Reiter präsentiert Eurer Hoheit sein Blaues Pferd: Karten und Briefe, (Prestel, München, 1988), 144. 2)“Das berühmteste Bild des Künstlers (…) eine Leinwand von 2 Meter Höhe und 1,30 Meter Breite schlägt uns in ihren Bann. Wir werden mit Macht an das Bild herangetrieben, schon im selben Augenblick aber zu achtungsvoller Distanz gezwungen. Wie eine Vision leuchtet dicht vor uns eine Gruppe von vier Pferden auf. Aus der Mittelachse nach rechts gerückt, füllt ihr Umriß das schmale Hochformat fast ganz aus, nur seitlich den Blick auf eine ebenso geheimnisvolle Landschaft freigebend. Der mächtige Körper des vorderen Tieres mißt nur wenig unter Lebensgröße. Das Pferd scheint aus der Tiefe nach vorn zu drängen und unmittelbar vor dem Beschauer zu verhalten, indem es den Kopf in edlem Schwung zur Seite wirft. Seine Stellung im Raum läßt sich nicht errechnen, denn der untere Bildrand überschneidet die Beine (…).” Klaus Lankheit, Franz Marc: Sein Leben und seine Kunst, (DuMont, Köln, 1976), 120. 3) In a volume Marc had in his own library – he discusses it as early as 1899 – Plato tells us that the four Helios horses had distinct attributes and personalities. The first (the horse in the front of the painting) is characterized by immense beauty, size and speed. Though Marc shows the sun and moon glowing within this animal, he also has an distinctive, recognizable blaze painted on the team leader’s face. The second horse, named after Hera, steers the chariot; the third “dark horse” upon whom the sun nonetheless shines is called Poseidon (slower than the second); and the fourth, stiffly relegated to the back, takes her name from Hestia: “The horses are peaceful and friendly and one does nothing without the others,” Plato and John Alexander Stewart, The Myths of Plato Translated with Introductory and Other Observations, (London: Macmillan, 1905), 173. 4) The objects from the Commagene excavation are listed in: Carl Humann, Otto Puchstein, and Heinrich Kiepert, Reisen in Kleinasien und Nordsyrien: ausgeführt im Auftrag der Königlich Preussischen Akademie der Wissenschaften Textband, (Berlin: Reimer, 1890). Besides the eponymous Pergamon Museum, objects from Nimrud came to reside at Berlin’s Vorderasiatische Museum. Preserved zoological specimens from archaeological sites and modern explorations were displayed at the Museum für Naturkunde, Institut für Systematische Zoologie. Marc visited all these collections on his trips to Berlin from 1907 through 1913.